The brain is a remarkably complex organ comprised of billions of interconnected neurons and glia. It is a bilateral, or two-sided, structure that can be separated into distinct lobes. Each lobe is associated with certain types of functions, but, ultimately, all of the areas of the brain interact with one another to provide the foundation for our thoughts and behaviours. In this section, we discuss the overall organization of the brain and the functions associated with different brain areas, beginning with what can be seen as an extension of the brain, the spinal cord. 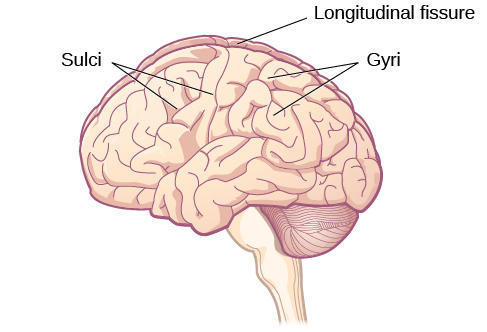 The surface of the brain, known as the cerebral cortex, is very uneven, characterized by a distinctive pattern of folds or bumps, known as gyri (singular: gyrus), and grooves, known as sulci (singular: sulcus), shown in Figure 9. These gyri and sulci form important landmarks that allow us to separate the brain into functional centers. The most prominent sulcus, known as thelongitudinal fissure, is the deep groove that separates the brain into two halves or hemispheres: the left hemisphere and the right hemisphere. The two hemispheres are connected by a thick band of neural fibres known as the corpus callosum, consisting of about 200 million axons. The corpus callosum allows the two hemispheres to communicate with each other and allows for information being processed on one side of the brain to be shared with the other side. Normally, we are not aware of the different roles that our two hemispheres play in day-to-day functions, but there are people who come to know the capabilities and functions of their two hemispheres quite well. In some cases of severe epilepsy, doctors elect to sever the corpus callosum as a means of controlling the spread of seizures (see Figure 10). While this is an effective treatment option, it results in individuals who have split brains. After surgery, these split-brain patients show a variety of interesting behaviours. For instance, a split-brain patient is unable to name a picture that is shown in the patient’s left visual field because the information is only available in the largely nonverbal right hemisphere. However, they are able to recreate the picture with their left hand, which is also controlled by the right hemisphere. When the more verbal left hemisphere sees the picture that the hand drew, the patient is able to name it (assuming the left hemisphere can interpret what was drawn by the left hand). Much of what we know about the functions of different areas of the brain comes from studying changes in the behaviour and ability of individuals who have suffered damage to the brain. For example, researchers study the behavioural changes caused by strokes to learn about the functions of specific brain areas. A stroke, caused by an interruption of blood flow to a region in the brain, causes a loss of brain function in the affected region. The damage can be in a small area, and, if it is, this gives researchers the opportunity to link any resulting behavioural changes to a specific area. The types of deficits displayed after a stroke will be largely dependent on where in the brain the damage occurred. Consider Theona, an intelligent, self-sufficient woman, who is 62 years old. Recently, she suffered a stroke in the front portion of her right hemisphere. As a result, she has great difficulty moving her left leg. (As you learned earlier, the right hemisphere controls the left side of the body; also, the brain’s main motor centres are located at the front of the head, in the frontal lobe.) Theona has also experienced behavioural changes. For example, while in the produce section of the grocery store, she sometimes eats grapes, strawberries, and apples directly from their bins before paying for them. This behaviour—which would have been very embarrassing to her before the stroke—is consistent with damage in another region in the frontal lobe—the prefrontal cortex, which is associated with judgment, reasoning, and impulse control. The two hemispheres of the cerebral cortex are part of the forebrain (see Figure 11), which is the largest part of the brain. The forebrain contains the cerebral cortex and a number of other structures that lie beneath the cortex (called subcortical structures): thalamus, hypothalamus, pituitary gland, and the limbic system (collection of structures). The cerebral cortex, which is the outer surface of the brain, is associated with higher level processes such as consciousness, thought, emotion, reasoning, language, and memory. Each cerebral hemisphere can be subdivided into four lobes, each associated with different functions. Figure 11. The brain and its parts can be divided into three main categories: the forebrain, midbrain, and hindbrain. 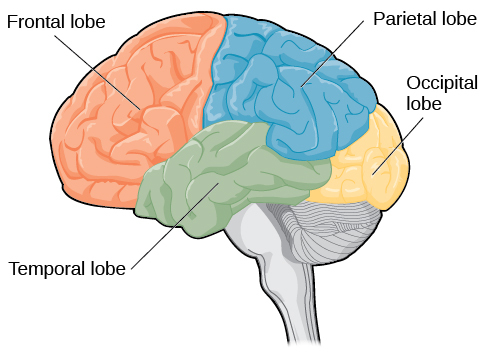 The four lobes of the brain are the frontal, parietal, temporal, and occipitawl lobes (see Figure 12). The frontal lobe is located in the forward part of the brain, extending back to a fissure known as the central sulcus. The frontal lobe is involved in reasoning, motor control, emotion, and language. It contains the motor cortex, which is involved in planning and coordinating movement; the prefrontal cortex, which is responsible for higher-level cognitive functioning; and Broca’s area, which is essential for language production. Figure 12. 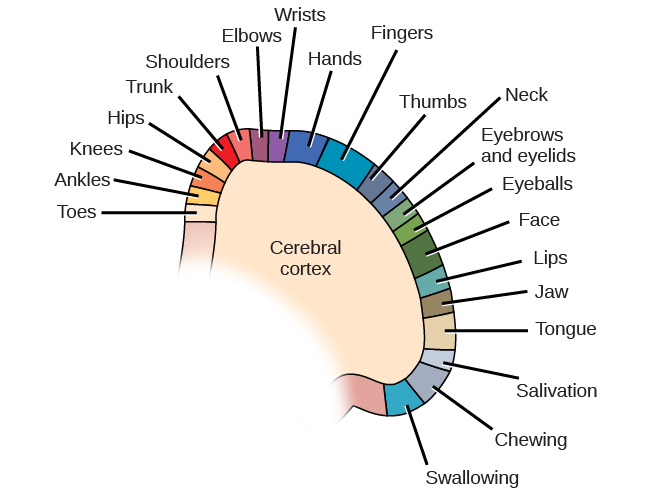 The lobes of the brain are shown. People who suffer damage to Broca’s area have great difficulty producing language of any form. For example, Padma was an electrical engineer who was socially active and a caring, involved mother. About twenty years ago, she was in a car accident and suffered damage to her Broca’s area. She completely lost the ability to speak and form any kind of meaningful language. There is nothing wrong with her mouth or her vocal cords, but she is unable to produce words. She can follow directions but can’t respond verbally, and she can read but no longer write. She can do routine tasks like running to the market to buy milk, but she could not communicate verbally if a situation called for it. 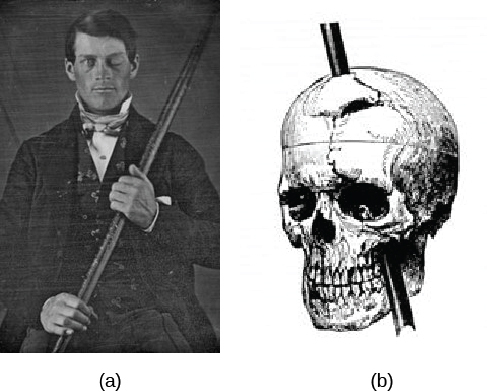 Probably the most famous case of frontal lobe damage is that of a man by the name of Phineas Gage. On September 13, 1848, Gage (age 25) was working as a railroad foreman in Vermont. He and his crew were using an iron rod to tamp explosives down into a blasting hole to remove rock along the railway’s path. Unfortunately, the iron rod created a spark and caused the rod to explode out of the blasting hole, into Gage’s face, and through his skull (see Figure 13). Although lying in a pool of his own blood with brain matter emerging from his head, Gage was conscious and able to get up, walk, and speak. But in the months following his accident, people noticed that his personality had changed. Many of his friends described him as no longer being himself. Before the accident, it was said that Gage was a well-mannered, soft-spoken man, but he began to behave in odd and inappropriate ways after the accident. Such changes in personality would be consistent with loss of impulse control—a frontal lobe function. The brain’s parietal lobe is located immediately behind the frontal lobe, and is involved in processing information from the body’s senses. It contains the somatosensory cortex, which is essential for processing sensory information from across the body, such as touch, temperature, and pain. The somatosensory cortex is organized topographically, which means that spatial relationships that exist in the body are maintained on the surface of the somatosensory cortex (see Figure 14). For example, the portion of the cortex that processes sensory information from the hand is adjacent to the portion that processes information from the wrist. Figure 14. Spatial relationships in the body are mirrored in the organization of the somatosensory cortex. The temporal lobe is located on the side of the head (temporal means “near the temples”), and is associated with hearing, memory, emotion, and some aspects of language. 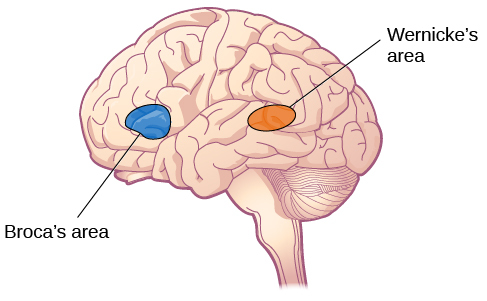 The auditory cortex, the main area responsible for processing auditory information, is located within the temporal lobe. Wernicke’s area, important for speech comprehension, is also located here. Whereas individuals with damage to Broca’s area have difficulty producing language, those with damage to Wernicke’s area can produce sensible language, but they are unable to understand it (see Figure 15). Figure 15. Damage to either Broca’s area or Wernicke’s area can result in language deficits. The types of deficits are very different, however, depending on which area is affected. Other areas of the forebrain, located beneath the cerebral cortex, include the thalamus and the limbic system. The thalamus is a sensory relay for the brain. All of our senses, with the exception of smell, are routed through the thalamus before being directed to other areas of the brain for processing (see Figure 16). Figure 16. 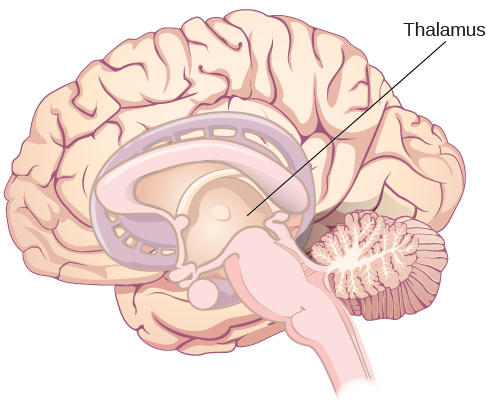 The thalamus serves as the relay centre of the brain where most senses are routed for processing. The limbic system is involved in processing both emotion and memory. Interestingly, the sense of smell projects directly to the limbic system; therefore, not surprisingly, smell can evoke emotional responses in ways that other sensory modalities cannot. 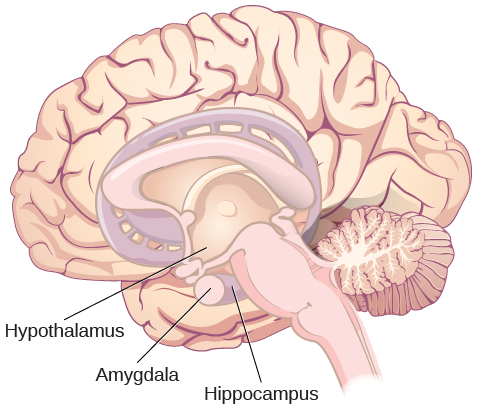 The limbic system is made up of a number of different structures, but three of the most important are the hippocampus, the amygdala, and the hypothalamus (see Figure 17). The hippocampus is an essential structure for learning and memory. The amygdala is involved in our experience of emotion and in tying emotional meaning to our memories. The hypothalamus regulates a number of homeostatic processes, including the regulation of body temperature, appetite, and blood pressure. The hypothalamus also serves as an interface between the nervous system and the endocrine system and in the regulation of sexual motivation and behaviour. Figure 17. The limbic system is involved in mediating emotional response and memory. The substantia nigra (Latin for “black substance”) and the ventral tegmental area (VTA) are also located in the midbrain (see Figure 18). Both regions contain cell bodies that produce the neurotransmitter dopamine, and both are critical for movement. Degeneration of the substantia nigra and VTA is involved in Parkinson’s disease. In addition, these structures are involved in mood, reward, and addiction (Berridge & Robinson, 1998; Gardner, 2011; George, Le Moal, & Koob, 2012). Figure 18. The substantia nigra and ventral tegmental area (VTA) are located in the midbrain. The hindbrain is located at the back of the head and looks like an extension of the spinal cord. It contains the medulla, pons, and cerebellum (see Figure 19). The medulla controls the automatic processes of the autonomic nervous system, such as breathing, blood pressure, and heart rate. The word pons literally means “bridge,” and as the name suggests, the pons serves to connect the brain and spinal cord. It also is involved in regulating brain activity during sleep. 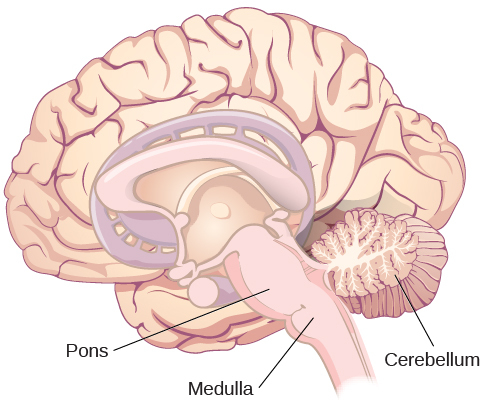 The medulla, pons, and midbrain together are known as the brainstem. Figure 19. 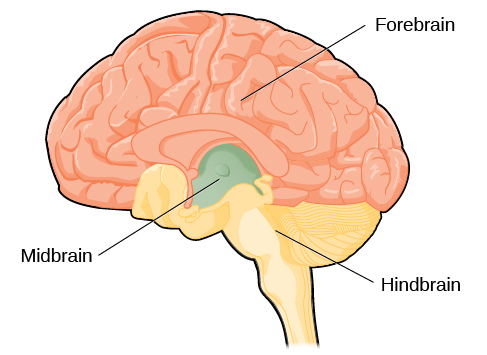 The pons, medulla, and cerebellum make up the hindbrain. A computerized tomography (CT) scan involves taking a number of x-rays of a particular section of a person’s body or brain (see Figure 20). The x-rays pass through tissues of different densities at different rates, allowing a computer to construct an overall image of the area of the body being scanned. 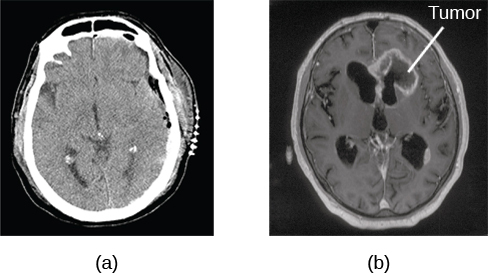 A CT scan is often used to determine whether someone has a tumour, or significant brain atrophy. 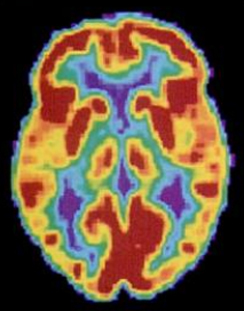 Positron emission tomography (PET) scans create pictures of the living, active brain (see Figure 21). An individual receiving a PET scan drinks or is injected with a mildly radioactive substance, called a tracer. Once in the bloodstream, the amount of tracer in any given region of the brain can be monitored. As brain areas become more active, more blood flows to that area. 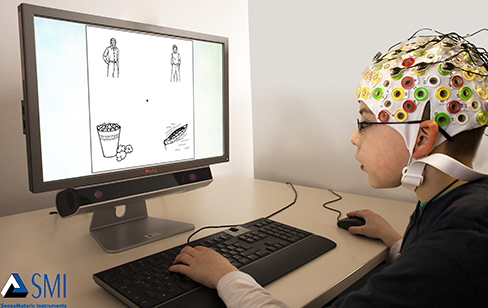 A computer monitors the movement of the tracer and creates a rough map of active and inactive areas of the brain during a given behaviour. PET scans show little detail, are unable to pinpoint events precisely in time, and require that the brain be exposed to radiation; therefore, this technique has been replaced by the fMRI as an alternative diagnostic tool. However, combined with CT, PET technology is still being used in certain contexts. For example, CT/PET scans allow better imaging of the activity of neurotransmitter receptors and open new avenues in schizophrenia research. In this hybrid CT/PET technology, CT contributes clear images of brain structures, while PET shows the brain’s activity. In magnetic resonance imaging (MRI), a person is placed inside a machine that generates a strong magnetic field. The magnetic field causes the hydrogen atoms in the body’s cells to move. When the magnetic field is turned off, the hydrogen atoms emit electromagnetic signals as they return to their original positions. Tissues of different densities give off different signals, which a computer interprets and displays on a monitor. 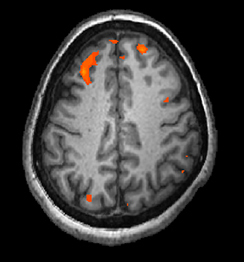 Functional magnetic resonance imaging (fMRI) operates on the same principles, but it shows changes in brain activity over time by tracking blood flow and oxygen levels. The fMRI provides more detailed images of the brain’s structure, as well as better accuracy in time, than is possible in PET scans (see Figure 22). With their high level of detail, MRI and fMRI are often used to compare the brains of healthy individuals to the brains of individuals diagnosed with psychological disorders. This comparison helps determine what structural and functional differences exist between these populations. In some situations, it is helpful to gain an understanding of the overall activity of a person’s brain, without needing information on the actual location of the activity. Electroencephalography (EEG) serves this purpose by providing a measure of a brain’s electrical activity. An array of electrodes is placed around a person’s head (see Figure 23). The signals received by the electrodes result in a printout of the electrical activity of his or her brain, or brainwaves, showing both the frequency (number of waves per second) and amplitude (height) of the recorded brainwaves, with an accuracy within milliseconds. Such information is especially helpful to researchers studying sleep patterns among individuals with sleep disorders. The Brain and Spinal Cord by Rajiv Jhangiani, Ph.D. is licensed under a Creative Commons Attribution 4.0 International License, except where otherwise noted.